Dr. Stephen Luby said in a recent New York Times article. Despite the seemingly unanimous desire to keep the world’s children safe, clean, and healthy, children under 5 remain one of the largest and most vulnerable populations on the planet. Particularly susceptible to diseases, infections, and malnutrition, young kids are involved in a game of chance: depending on where a baby is born, whether the mother is educated, and the annual income of the household, the odds of celebrating a 5th birthday are drastically affected. The World Health Organization reported that last year alone, 2.3 million children under the age of 5 died and that over 50% of those deaths were from preventable causes. A major (and preventable) determinant of childhood ill health and mortality is poor sanitation and sanitation practices. Taro Gomi once said, “Everyone Poops,” and he was right. However, because billions of people practice open defecation (think pooping in an open area, not a toilet), or use poorly developed septic and waste removal systems, our poop is killing us. Literally. An estimated 1,800 kids under 5 die every day from illness caused by direct contact to feces. That’s over 650,000 deaths every year. And poop is a problem that will never go away. But the solution is complex. It’s not just about installing pipes and porcelain. In fact, reports have shown that installing toilets in schools and villages in India have been largely unsuccessful in reducing rates of open defecation and disease. Surveys show that septic tanks are often too small or are not connected to a functioning/sustainable septic system. Those that are properly functioning may flow directly into waterways. Cultural practices and lack of understanding often create a barrier to proper toilet use and effective maintenance. Each year during the rainy season fields, waterways, and even toilets that once served as septic or personal ‘dumping’ sites flood, carrying raw sewage into the streets and into homes. In homes with dirt floors, contaminants live in the floors and spread to its inhabitants, particularly crawling infants. In other words, stopping the spread of poop needs to be more than just giving out toilets. Recently released, the UN Millennium Development Goals Report points out that between 1990 and 2012, almost 2 billion people gained access to an ‘improved sanitation facility’ (defined by the World Bank as flush/pour toilet connected to piped sewer system/septic tank, ventilated and covered pit latrines, and composting toilets). However, in 2012, 2.5 billion people still did not use an improved sanitation facility and 1 billion people continued to resort to open defecation. The economics are telling as well. In 2011, the World Bank reported that despite marked improvements in rural sanitation in Bangladesh, economic loss due to sanitation was billed at $4.22 billion U.S. dollars, or 7% of that country’s annual GDP. More specifically, it is estimated that almost $1.5 billion of the total spending can be directly linked to diarrhea-related childhood illness and mortality. So what does it all mean? If toilets can’t adequately deal with our poop, what can? Last week, at the Global Citizen Festival’s Action Summit in New York City, the question of how to “tackle” sanitation was at the forefront. During break-out sanitation sessions mediated by panelist speakers such as Sarina Prabasi, CEO, WaterAid America and Junaid Ahmad, Senior Director, Water Supply and Sanitation Collaborative Council – WSSCC, The World Bank concluded that traditional and nontraditional education such as theater and arts, sense of local ownership over sanitation issues and facilities, cultural considerations, and the breaking down of taboos around the subject of sanitation (like the word “poop”!) are key to the progression of global sanitation and must go hand-in-hand with the implementation of toilets. Simply put: the way forward is through integrative, holistic and locally-specific strategies that promote behavior change. But this takes time. So at ARCHIVE, we’re looking at home-based sanitation solutions that don’t have to wait. Our flooring project, High Fives, knocks out breeding grounds for bacteria by implementing impermeable and cleanable floors. 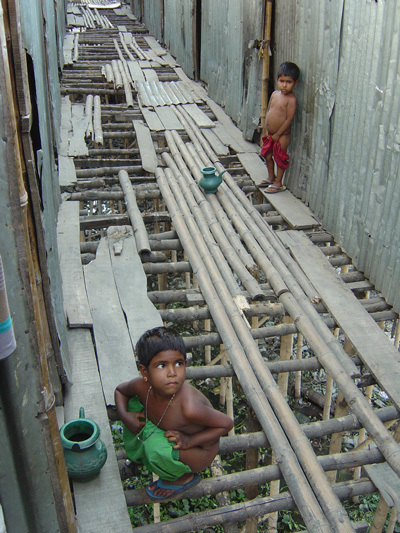 By replacing 500 floors in the next year ARCHIVE hopes to empower people in Bangladesh so that regardless of toilets, sewer systems, and the long-process of behavior change, families can keep poop out of their homes. What do you think is the best way to address global sanitation? Send your thoughts and ideas to [email protected] with the subject line: Let’s talk about poop.